The 2016:3 issue of the refereed Norwegian Journal for Art and Culture (Kunst og Kultur) is dedicated to the topic of ’Instrumentality’, and presents contributions from several ENID-members. Contributions both in English and Norwegian/Danish. Guest editors of this issue: Eli Heldaas Seland (Senior Research Librarian at Bergen University College, Norway) and Laura Katrine Skinnebach (postdoc. at Dept. 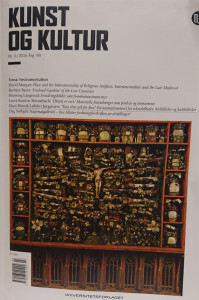 Of Aesthetics and Communication at Aarhus University, Denmark), both members of European Network on the Instruments of Devotion (ENID). No. 3 2016, Årgang 99.